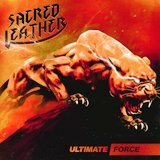 Browsing recent releases and in the mood for some more heavy metal after last week's encounter with Visigoth's sophomore release, I happened upon Sacred Leather's first LP, Ultimate Force. The band captures a driving NWOBHM sound and freshens it up in a more modern format -- but scratch the surface and this could be played on any hard rock station in the early 80s without anyone searching the studio for time travellers. The first thing the listener hears on the album are chugging two-guitar riffs, full of reverb and accented with lead-guitar noodling. The title track is a standout in this regard, a distillation of every headbangable moment that Judas Priest ever delivered on its 80s albums. The other thing you'll hear a lot of are high screams. Unlike some of the young heavy metal revival bands appearing in recent years, Sacred Leather doesn't try to eliminate the obsolete vocal features of their 80s forebears; they revel in them, with vocalist Dee Wrathchild, better known as Skeletonwitch's drummer, delivering most of the vocals in tones that suggest balls caught in a vise -- and perfectly nailing Halfordian screams. This treatment makes especially enjoyable the over-the-top Power Thrust, whose double-entendre-filled lyrics deliver irony-free fun as another 80s staple. Virtually all of the songs seem to have been crafted for maximum crowd effect. Witness Master is Calling, in which the band pauses the melody and most of the instruments just in order to do a dramatic drum build-up, or virtually any of the songs with speed, which soon leap from crunching mid-tempo to galloping. Where the band stumbles is on slower tracks. As soon as they slow down, most of their energy evaporates, best shown in the rather tedious Dream Search, where clean vocals predominate and an amalgam of crappy power ballad practices come grinding out over approximately 8 minutes of misery, but even to a lesser extent in The Lost Destructor / Priest of the Undoer, which attempts an epic sound but has twice the length and none of the variety of the stronger tracks on the album. Such missteps are forgivable, however, in light of what Sacred Leather can deliver on their better tracks. Ultimate Force has some flaws, but its successes are greater.